Adapting a book into a film is never an easy task. There is always a good chance certain details will get left out and for fans of the books this comes as a hard truth. Sometimes this works in the films favor, by leaving out certain plot points it allows the flow of the movie to go more smoothly. And of course there is also the fact that there is only a so long an audience is willing to sit. If someone were to adapt a book word for word, you would more than likely end up with a four hour movie. Sometimes adaptions work well though and there have been cases that has been so. Harry Potter, and Lord of the Rings are good examples of how alterations aided in delivering a successful movie. When the Narnia films were next to be adapted there was some hesitation among fans. For those who don't know, the books are very complex and sometimes so fanciful it can be hard to accept. The first film had to do with four siblings stepping through a magical wardrobe that transported them to a fantasy realm in which they were the heroes in an age old war against an evil queen. The next film saw those same siblings return to that world, only hundreds of years had passed and now a young prince was seeking their help in restoring his place on the throne. The third book to be adapted was The Voyage of the Dawn Treader. This time around only two of the four siblings return to Narnia, Lucy and her brother Edmund. While on holiday at their cousin's home they stumble across a strange painting. Somehow they are drawn into the painting and wind up in the middle of the ocean, their cousin Eustace along for the ride. They are rescued by a ship crossing their path, named the Dawn Treader and piloted by none other than Prince Caspian. He informs them that he is on a quest to locate the seven lords of Narnia. Of course both Lucy and Edmund are eager to help, while their cousin Eustace is less than enthusiastic. They make their way to the Lone Islands where after some difficulties they locate the first of the seven lords, Lord Bern. Caspian appoints him Duke of the Lone Islands and the comrades set sail once again. Eustace is extremely unhappy with all that has transpired; having a sour disposition to begin with and none too pleased with his circumstances, he only succeeds in making things more difficult for those around him. At the second island Eustace runs off and winds up in more trouble than he expected. With Eustace making things more difficult by running away, the seemingly dauntless task of finding the lords, and the possible return of the Ice Queen, the comrades have the odds stacked against them. But through faith, trust and friendship they are ready to face any ordeal head on. The tricky thing with a film like this is really the material it draws from. The Chronicles of Narnia was always aimed more at children than adults and that is evident given the context in which events take place in the movie. Lucy and Edmund return to Narnia through a painting this time and are adventuring in a realm so fantastical at times it borders on inane. These series of books just seem very difficult to adapt, but with the success of other series like Harry Potter and Lord of the Rings it isn't surprising that it made it to theaters. Now after it's time on the big the screen, it has made its way to the small screen via Blu-ray on three separate discs. The first of which contains the Blu-ray version of the film, an animated short about the ship The Dawn Treader, a guide looking into the legends and lore of the ship, deleted scenes, exploring the islands, a look at the different characters of Narnia, 3 behind-the-scenes features, and audio commentary from the crew. Disc two is just the standard version of the film and disc 3 is a digital copy for transportable use. Given the level of effort that went into the film, the amount of extras on this 3-disc set seem a bit lacking, while certainly numerous they don't seem to go very deep, especially given the large history with all of the books. 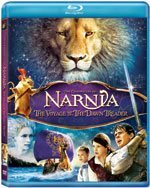 Overall The Chronicles of Narnia: The Voyage of the Dawn Treader is a fun movie and can be enjoyed by people of all ages. Download The Chronicles of Narnia: Voyage of the Dawn Treader from the iTunes Store in Digial HD. For more information about The Chronicles of Narnia: Voyage of the Dawn Treader visit the FlickDirect Movie Database.